Codes of Practice (COP) are admissible in court proceedings under the WHS Act and WHS Regulations. Courts may regard a COP as evidence of what is known about a hazard, risk or control and may rely on the COP in determining what is reasonably practicable in the circumstances to which the code relates. Under the WHS Act a PCBU has the primary duty to ensure, so far as is reasonably practicable, that workers and other persons are not exposed to health and safety risks arising from the business or undertaking. accessible at all times that the workers carry out work. procedures for first aid and for reporting injuries and illnesses. kits and the number of trained first aiders is appropriate. 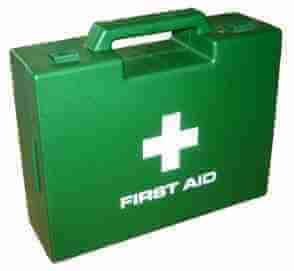 work related injuries and illnesses requiring first aid would be minor in nature. The size and location of the workplace also needs to be considered. A large workplace may require first aid to be available in more than one location. where there is a higher risk of injury or illness occurring. worker. This would assist in enabling an immediate emergency response.